The XC2 is SureFire’s smallest, most lightweight handgun light with an integrated laser. It features a recoil-proof LED that’s focused by a multi-faceted reflector to create our broad 300-lumen MaxVision Beam perfect for illuminating and identifying threats at close range. The XC2’s 635nm red laser is highly visible and, once zeroed, rarely needs re-zeroing thanks to adjustment screws that won’t back out from the effects of recoil. Measuring less than 2.5 inches long and weighing just two ounces, the XC2 won’t weigh down your handgun, making it a crucial addition to concealed-carry pistols among other applications. Its compact body is constructed of lightweight but strong aerospace aluminum with a Mil-Spec hard anodized finish, so the XC2 is rugged enough for everyday carry. Ambidextrous switching provides both momentary-and constant-on activation for precision control. 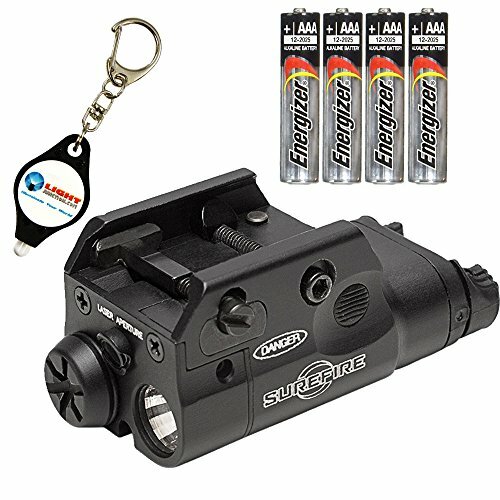 If you have any questions about this product by SureFire, contact us by completing and submitting the form below. If you are looking for a specif part number, please include it with your message. Streamlight TLR-8 Tactical Weapon Light/laser 500 Lumens Black Finish "New Item"